I started flying as co-pilot in December, 1951. My salary as co-pilot was $475 per month. That was $100 per month more than my salary as ground operations engineer; however ground operations engineers were paid over time and pilots and co-pilots were not. The pilots and co-pilots worked a lot of overtime in 1952. We worked a lot of 6 and 7-day weeks. One Saturday I remember flying in three airplanes with only a small hamburger for lunch. It was a tough day. Ed Brasher was the pilot, and he was a workaholic. My first ride in a B47 was in the nose at the navigator’s station. It was quite a job to climb up the ladder with the chute, to get strapped in the seat and get the oxygen mask hooked up. It was worth it though. What a smooth ride! It was amazing to see an indicated airspeed of 400kts, twice as fast as I had ever seen before. There was very little noise or vibration. The jet age in 1951 had not come of age. Pilots of jet airplanes were looked on as nuts with suicidal tendencies. It was a risky business, but not as much as laymen thought. Still those of us who flew in them were apprehensive. Strange vibrations and noises were felt and heard with fear. I remember one flight when the flight crewmembers heard a muffled explosion in the cockpit. There was a quiet inquiry, “did you hear that?” “Yes, what was it?” “ I don’t know, let’s go back”. Investigation on the ground turned up a small paint can inadvertently left under the co-pilot’s seat. The lid had popped off with decreasing cabin pressure. Another flight I was co-pilot on, while flying at 35,000ft, the pilot almost whispered to me. “Jim, you fly it I’m putting my seat down, the windshield just cracked. We were all afraid of the windshield or canopy breaking with resulting explosive decompression. Early in the B47 test program in Seattle the front of the canopy had come loose and dished down and crushed the pilot’s head. 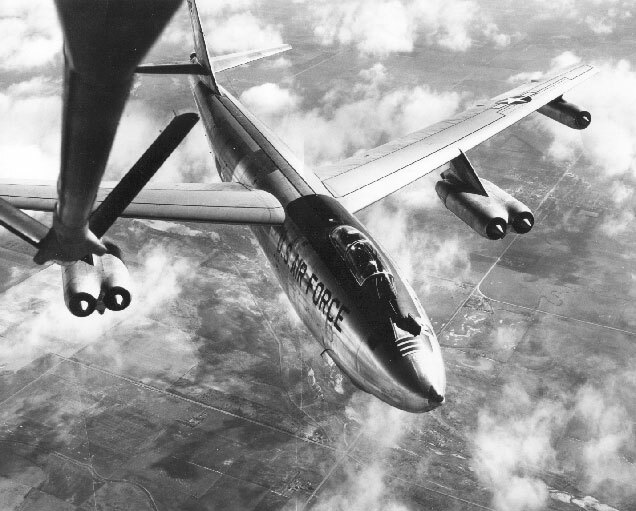 A lot of flight-testing on the B47 was concerned with improvements to the airplane. For example, the airplane had a pitch up problem at high Mach number, about .78 mach. The airflow would separate from the outboard portion of the wing. This moved the center of lift inboard and forward, because the wing was swept aft. The pitch up was quite abrupt and disturbing, so something had to be done. One solution tried was to extend the outboard portion of the wing aft. The XB47 was so modified, but it didn’t work. The next experiment was vortex generators. These were little airfoils mounted vertically on the wing in the area of the airflow separation. They were small, about one inch by one inch. Their job was to churn up the boundary layer and add energy to it to delay the airflow separation. Surprisingly they worked and made the airplane more flyable at high Mach number. The first ones were castings and were brittle. Visiting firemen walking out on the wing quite frequently walked over them and snapped them off. They snapped, crackled, and popped as they broke off, and tinkled when they hit the ground. A very disconcerting sound. Later they were made by a different method and of less brittle metal. Then they were a little lethal if you slipped and fell amongst them. One of the jobs of a ground operations engineer was expediting parts. One day I was sent to receiving to check on some vortex generators, which had supposedly been sent from Seattle. The man on receiving went to check. After a long time he came back and told me there were no generators. I had difficulty explaining that vortex generators were not your usual type generators. He went back and found them. 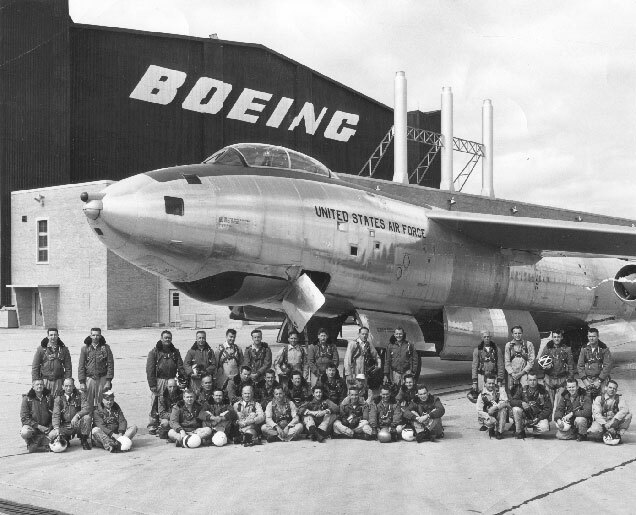 Along about June of 1952 Boeing Wichita got a contract to fly a service test B47 for 1000 hours. The idea was to put 1000 hours on a test airplane as rapidly as possible to find any flying or maintenance problems. I don’t know about the maintenance problems, but we did have some flying problems. I was on one of the first with Ed Brasher. It was decided at the start that weather would be no deterrent. The airplane was supposed to be all-weather and fly in anything. We soon decided that did not include thunderstorms. Ed Brasher was pilot on the flight I am thinking of, and I was co-pilot. Gerald Simons and George Hardwick were the navigators. We were flying north over Florida then Georgia at 35,000 ft. Thunderstorms were popping up all over the place. Having been scared by thunderstorms before, I was concerned, but thought things would be OK because we could see the storm clouds and fly around them. Then we entered some clouds and could not see the storms. Then the alternators quit. They were the power for our radar; our last means of detecting the location of the thunderstorms. Then we entered a thunderstorm. It was rough, but not as bumpy as in other airplanes. The B47 had a flexible wing, which absorbed the shocks. Looking out at the wing tips was frightening though, because they were bending a lot. I began to think about what to do if worse came to worst. That is, how long should I delay pulling the ripcord after bailout? I didn’t want to be suspended in my parachute in the middle of a thunderstorm. Also I wanted to be down lower in more breathable air when the chute opened. We didn’t have ejection seats or automatic opening devices for our parachutes. I looked down in the crawlway toward the bailout door to see if the way was clear. There easing back toward the door was Mr. Simons. His face was as white as a marshmallow, and I am sure mine must have looked the same. I guess we both had the same thing in mind. We got struck several times by lightning. Ed said ten times; I didn’t think about counting. They were strange strikes. They made a sizzling noise, not a big boom. Ed said later that he could see the lightning path paralleling the airplane then swinging in to strike the nose. The airspeed concerned me. I saw 80kts at one time, and thought we would stall, but apparently the pitot tubes were iced up and the airspeed readings were erroneous. We stayed in the air. On inspection of the airplane after the flight, very little damage was found. The electrical discharges after the lightning strikes had left little burned holes in the airplane. Flights in 2137 were looked on as a boon and a bust. A boon because they usually paid a bonus, and a bust because they lasted 10 hours or more, and you had a busted rear end by the end of the flight. We were paid speed and altitude bonuses at that time; $100 for exceeding 450 mph or .81 mach, $50 for flying above 35,000 ft., and $100 for flying above 42,000 ft. Most of the 2137 flights were climbing cruise flights, which started at 30,000 ft. and ended cruise just above 42,000 ft. It was a tragedy if we flew for 10 hours and didn’t quite get to 42,000 ft.
2137 flights always involved aerial refueling to extend the flight time. Rendezvous was made with the KC97 Tanker about halfway through the flight. Many times the fuel remaining was critically low before we caught the tanker. I remember one day searching for the tanker near Fall City, Kansas. We had radar with which to rendezvous so we knew we were close, but the visibility was so poor we got critically low on fuel before we spotted the tanker. I think we got down to 2,000 Ibs which wasn’t enough to get to our nearest landing place, Wichita, about a 100 miles west. Another incident occurred on a flight I was on as co-pilot for Ed Hartz. We were about 40,000 ft. over Eureka, California at night. Ed discovered the elevators would not move. Apparently they were frozen. Our flight condition was critical any way, because of our high weight and high altitude. We didn’t need another complication. We were at a flight condition colorfully called “ coffin corner” by some writers. If we slowed up a little we got low speed buffet, and if we speeded up we got high-speed buffet. It seemed like an impossible situation. Ed solved it by reducing power and milling around in low speed buffet until the airplane sank to a lower altitude where the warmer temperature thawed out the seals in the balance bays of the elevators so the elevators would move again. The 2137 program carried on for about a year. It was tough for the ground crews and flight crews. The ground crews many times met the airplane in the middle of the night, serviced it, worked off what squawks they could and sent it on it’s way. The program probably cost Ed Brasher his good health for several years. He lost the sight of one eye due to a sinus condition caused from flying with a cold. Most of the optic nerves of one eye were lost. He managed to fly with one eye for quite a while, but was finally grounded. In the meantime he made good landings even with only one eye. He also had a stomach problem, an ulcer I think. When the program finally came to an end it dried up our source of extra funds, the bonuses. Fortunately for me, I was selected for upgrade to pilot. This made a difference in job interest, prestige, and money.